As the June 21 summer solstice nears, the city of Yulin in South China's Guangxi Zhuang Autonomous Region is bogged down in a dog meat festival dilemma. The city's carnival-like festival, formed spontaneously in the 1990s, features residents devouring lychees and dogs. But as the festival becomes known to a wider population, there have been more protests on the Internet, especially in social media, where Net users call for an end to the festival. Dog meat has become a traditional food wrapped in controversy, namely animal rights and sanitary concerns. Dog meat, rarely consumed in the West, is considered a delicacy in many Asian cultures including China, South Korea, North Korea, the Philippines, Vietnam, Cambodia and Thailand. A "dog meat festival" in South China has reignited the national debate revolving the consumption of dog meat. 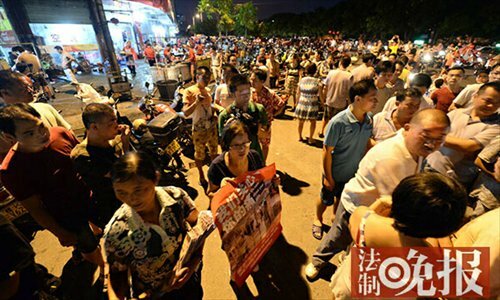 The controversy surrounding the event in Yulin, Guangxi Zhuang Autonomous Region, shows little sign of abating nearly a week after the festival. Dog meat restaurants have, in recent years, endeavored to revive the local tradition of eating dog meat for the Summer Solstice by promoting festivals to try to attract diners from across China. This has been met with fierce opposition from dog lovers and celebrities who denounce eating "man's best friend." 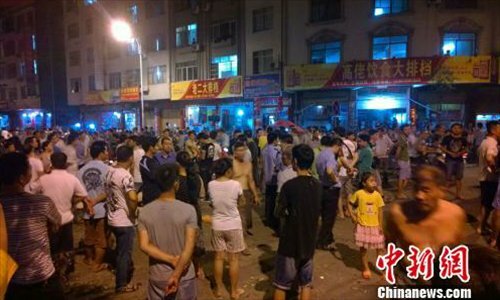 Debates over animal rights versus local tradition have escalated into cursing and fighting in Yulin, Guangxi Zhuang Autonomous Region, as a local festival featuring the eating of dog meat and lychees on the Summer Solstice returned on June 21. Eight people who claimed themselves Buddhist followers, led by a monk, showed up at the largest dog meat market in Yulin, in South China's Guangxi Zhuang Autonomous Region on June 18, praying that the souls of butchered dogs can be released from suffering. Health workers have allegedly been ordered not to eat dog in public and so avoid public criticism as a controversial annual dog meat festival approaches in Yulin, Guangxi Zhuang Autonomous Region. The Yulin government issued a notice on June 6, claiming that it has never organized any form of dog meat festival. The government has urged restaurant owners, civil servants and even medical staff to keep a low profile and adding that it will "strictly enforce" food safety regulations - effectively abandoning dog-meat lovers to their own devices. The government recently invited restaurant owners to a meeting, suggesting they not provoke animal lovers by butchering dogs in the street, hanging cooked dogs in the window or using the word "dog" in their names and menus, a restaurant owner told China News Service. Animal rights activists clash with locals on June 21 as their flyers are grabbed by an unidentified man. 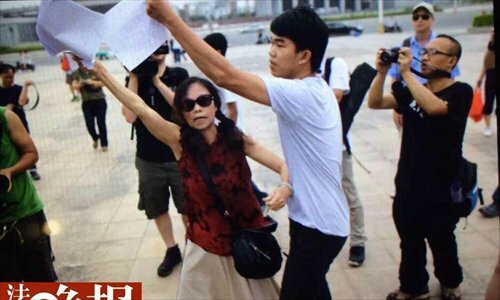 Du Yufeng, an animal rights activist, delivered leaflets reading “Yulin, we cry for you today” in front of the Yulin government building at about 11 am on June 21. 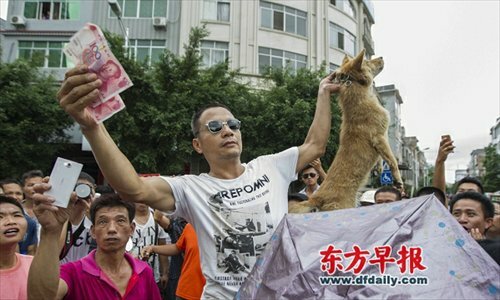 Animal rights activists march on Jiangbin Road, Yulin at 8:00 pm on June 20. The picketers held signs that read “Love animals, refuse to eat dogs and cats,” and “You’re eating those that help protect your home.” The activists also handed out literature and pickets to onlookers. Some patrons of the many dog meat restaurants that dot Jiangbin Road reportedly had brief altercations with protestors. Protestors clash with dog meat advocates outside a restaurant at about 8 pm on June 21. A man surnamed Lü told the reporter that he saw blood on the mouth of one dog eater as a result of an altercation. A witness said that locals gathered around the injured man and police detained people involved in the incident. 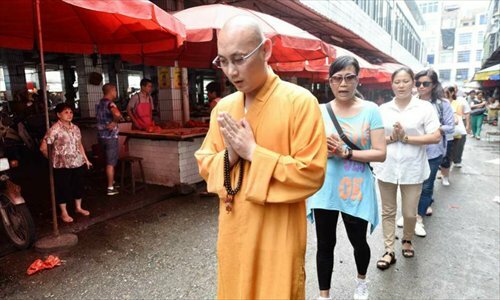 Eight people who claimed themselves Buddhist followers, led by a monk, pray that the souls of butchered dogs can be released from suffering at the largest dog meat market in Yulin, in South China's Guangxi Zhuang Autonomous Region on June 18, 2014. 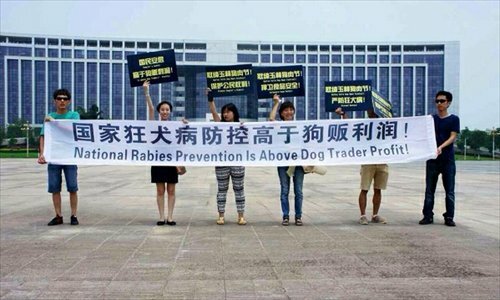 On June 13, 2014, several activists hold banners and posters saying that, "National rabies prevention is above dog-trade profit" and calling for food safety in front of the Yulin government building. One local restaurant owner, surnamed Ning, recently received dozens of harassing phone calls and messages per day, with some dog lovers calling at midnight, reminding her to be careful about the safety of her family members. News portal youth.cn reported on June 10 that 10 unidentified people broke down the door of a slaughterhouse in Yulin and confronted merchants, while trying to save the dogs. Some Chinese celebrities, including actresses Sun Li, Yang Mi and Zhao Wei, made appeals on social media to cancel the dog meat festival. On May 30, Hong Kong movie director Derek Yee wore a sticker calling for the cancellation of the Yulin festival while attending the premiere of his movie Overheard 3. A dog meat vendor threatens to butcher a dog if animal rights activists do not buy it from him at a market in Yulin on June 20. 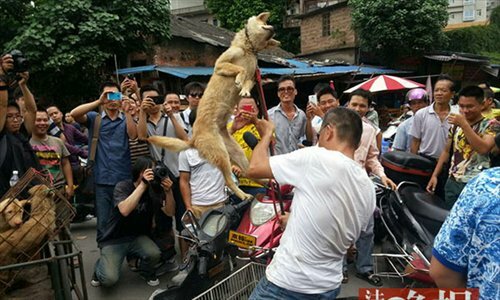 The confrontation began when animal rights activists attempted to save live dogs at the meat market by purchasing them. The vendor waves money to the crowd as he rides on his electric bike after animal rights activist Zhao Jie ( pseudonym) from Chongqing paid 350 yuan ($56.21) for the dog. ● Restaurants selling dog meat in the South China city of Yulin are removing or covering up the word "dog" in their restaurant names or menus as a controversial annual dog meat festival approaches. ● Some restaurant owners assessed that their businesses will not be affected, although the price of dog meat will surely rise due to fewer available dogs in the area. “There is no need for worry as our dogs are from a legal source, and we pay taxes and run our business legally,” one restaurant owner said. However, the owner added it will be difficult to change the local tradition of eating dog meat on the summer solstice, which has practiced for more than a decade. The rational ideas that would allow dog-lovers and dog-eaters to respect other people's choices were not adopted in this debate. This demonstrates a level of immaturity in Chinese society when dealing with internal conflicts. Chinese people are not pious believers in the rule of law, and they tend to think that the majority's choice equals the legitimacy of an action. In cases when the majority is committing the crime, law-enforcement forces will sometimes hesitate to take action. When there are disagreements on values, most people are eager to prove they are right and the others are wrong. So far, forgiveness and mutual understanding is just a slogan instead of an action. The main reason this dog meat festival has caused so much trouble is that the bloody pictures and videos of dog butchery, most done openly at market, were posted online. These things will hit a dog lover's nerve. Local authorities should conduct strict and detailed regulations of the whole dog slaughter process. They need to impose stricter hygiene standards on dog meat producers, which on the one hand will squeeze small vendors, whose hygiene conditions cannot meet standards, out of the market, and on the other hand, make sure dogs are killed in a more humane manner making the meat safe and certified. In the globalized era, modern practices are swiftly becoming the norm. Many of the local customs are coming under more pressure to be replaced or eliminated. It's not just in China; foie gras and bull fighting for example, are just two cases of time-honored traditions being targeted in the modern era. There is no easy answer to this. But in Yulin's case, what is definitely unacceptable is the brutal killing of the dogs. Combating animal abuse is probably an easier way for local people to start engaging in animal rights activism. "To persuade people to stop eating dog meat with extreme actions and fierce arguments would be counter-productive. We should advocate the idea in a reasonable way," Li said. Li believed that while eating dog meat is not illegal, running such a business is, since China doesn't have quarantine regulations on dog or cat-meat products, unlike those for pork, chicken or beef. Li suggested that activists should make constructive proposals, instead of simply protesting. "We need to take this slow, by filling up the legal vacuum on animal welfare first, then help regulate the way people treat animals and gradually educate the public," Li advised. Considering China’s current situation, we have to start with the public’s basic perception of animal protection. That is to say, we need to raise public awareness over the animal abuse. Legally, the current boycott must not violate laws and dog meat merchants should follow food safety and sanitation laws and regulations. The next step in animal protection is focusing on animals with ‘higher intelligence.’ Protecting those with ‘lower intelligence’ should involve making sure they do not suffer while being raised or butchered. "The consumption of dog meat has a long tradition, especially for people of East Asia. There is nothing wrong with it. I see no need to protest the Yulin dog meat festival." The ideas expressed are those of the author alone, and do not represent the position of the Global Times. @色拉陽智法王：Humanity should respect animals. In Buddhism, killing animals is a serious issue. Not only humans, but all living beings are precious. All that is alive should see life as irreplaceable. @网友stephan: Should we still maintain a traditional culture even if it is cruel and horrible? Open your eyes and face the facts, China doesn’t like animals nor is kind to them. Only pandas get special treatment. @山海连城论坛：Dog meat is a traditional delicacy in many Asian countries, including China, South Korea, the Philippines and throughout Southeast Asia. Because dogs are seen as a traditional food in so many places, they are slaughtered in great numbers, including smaller pet dogs. Dogs are man’s best friend. We should oppose the killing of dogs. @网友chaz hen: I support the dog meat festival. It has been part of the local culture for many years. We should not only protect the environment, but also culture. Animal rights folks should stop complaining. While they worry about dogs being killed for the festival, millions of cows, pigs and sheep are slaughtered for food everyday. People choose to raise dogs in their homes, dress them in ugly clothes and carry them in handbags while they shop. But did you ever consider that dogs may not want to be pets? As long as the dog meat festival remains a responsible and sustainable one, it’s not cruel. Animal protection activists around the country have helped intercept several trucks stuffed with dogs in recent years, trying to prevent stolen dogs from being sent to illegal slaughter houses to be sold as food. These actions prompted the Ministry of Agriculture to issue a circular on April 22, 2013, requesting local governments to strengthen cat and dog quarantine at the origin to control diseases that can be transmitted from animal to human, said Liu Lang, president of the Beijing Small Animal Veterinary Association, who helped draft the circular. Some 300 volunteers in Qijiang county, Chongqing are attempting to secure the release of nearly 900 dogs that are suspected of being stolen from their owners and were found March 2, 2013 on a truck heading for dog meat restaurants in Guangdong Province. A Weibo account, named Aiteguan, who claimed to run a dog meat restaurant in Beijing, has been blocked since the morning of January 19, 2013 after Web users complained it posted gratuitously brutal pictures and promoted dog meat eating. Aiteguan then used other Weibo IDs and recruited other dog meat eaters to attack animal rights activists online. A restaurant selling a seasonal dish of dog meat hotpot was forced to remove its sign featuring a golden retriever on February 12, 2012, after dog lovers posted photos online and urged people to boycott the eatery. The eighth Dog Meat Festival in Zhejiang Province will not be happening after local officials folded under public pressure and banned the event. As a government-sponsored activity, the festival has been held for eight years. Insiders said 5,000 to 10,000 dogs were slaughtered during the festival. Many of them were stolen pet dogs or poisoned dogs. "Dogs, no matter whether they are pet dogs or not, are the close friends of human beings and should not be eaten," said Qin Xiaona, director of the Capital Animal Welfare Association. The current Animal Protection Law does not ban the slaughter of dogs for meat, nor does it protect dogs on dog farms from abuse. It only applies to dogs kept in a house. Therefore, it is technically illegal to process dogs like livestock and use dog meat as any kind of food product. However, it is not illegal to breed, or raise, or slaughter dogs for dog meat. A South Korean dog meat festival has been canceled following growls of protest from animal rights activists, one of the would-be organisers said on June 28, 2011. "This is making our country an international laughing stock, and making the whole world mistakenly believe that all South Koreans eat dogs," Park So-Youn, head of Coexistence of Animal Rights on Earth, is quoted as saying. "Our ancestors believed hot dangogi (dog meat) soup consumed during the dog days of summer helped prevent diseases from malnutrition and bolster stamina," the official Korean Central News Agency said. In Vietnam, some believe that eating dog before the New Year holiday helps chase away bad luck accumulated during the previous year. At other times of the year, dog-meat dishes are thought to enhance virility and sexual prowess. Experts indicated that prevention plays a primary role in averting rabies.